BEIRUT - Extremist groups are waging a "genocide" against Christians in the Middle East, a former Lebanese president said Monday, after . Amin Gemayel, a Christian who served a six-year term as president in the 1980s, cited the attack in Egypt and recent violence in Iraq as he urged leaders to give Christian communities a larger political role. "Massacres are taking place for no reason and without any justification against Christians. It is only because they are Christians," said Gemayel, who leads Lebanon's right-wing Christian Phalange party. "What is happening to Christians is a genocide," he said. Lebanon, which experienced a ruinous 15-year civil war, in part between Muslims and Christians, that left about 150,000 dead, is deeply divided along sectarian lines. Christians make up about 40 percent of Lebanon's 4 million people and the country is the only Arab nation with a Christian head of state. The Phalange party, which was founded in 1936 by Gemayel's father, Pierre, fought heavily on the Christian side during Lebanon's 1975-90 civil war. Militias linked to the party carried out the notorious massacres of Palestinians in the Sabra and Shatilla refugee camps in 1982. Egyptian police are focusing their investigation into the New Year's suicide bombing on a group of Islamic hard-liners inspired by al Qaeda and based in the Mediterranean port city of Alexandria. Scores of Iraqi Christians have been killed in the past months at the hands of extremists as well. The bombing touched off riots and protests by Egypt's Christian minority, who feel they are targeted and discriminated against and do not get adequate protection from authorities. There were signs of beefed up security outside churches nationwide and dozens returned to pray Sunday in the bombed, blood-spattered Saints Church - many of them sobbing, screaming in anger and slapping themselves in grief. Late Sunday, riots erupted outside the cathedral-headquarters of the Coptic Church after the country's top Muslim religious figures and government officials met with Pope Shenouda III. Protesters threw bottles and stones at riot police outside the cathedral, injuring 45 policemen, security officials said. Elsewhere, demonstrators threw stones at cars on two main highways, and hundreds marched in other parts of the capital, said the officials, who spoke on condition of anonymity because they were not authorized to talk to the press. 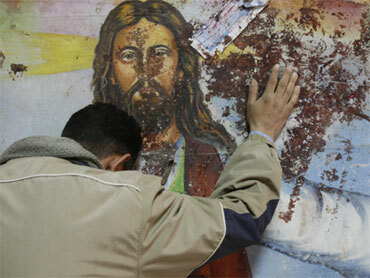 Egyptian newspapers warned on Sunday that "civil war" could break out unless Christians and Muslims close ranks.